Quick status, May 20, 2008: This musicbox system has been replaced by my iPhone. The musicbox served me well for about 5 years, but now, to me, the iPhone is a far cooler and more convenient way to listen to music and podcasts in my car. 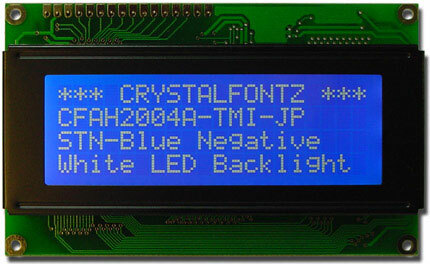 Quick status, May 26, 2004: I finally found a blue 4x40 character parallel-interface LCD, from crystalfontz.com, for about $50 -- same as the green ones. Oh, and the musicbox now uses an infrared remote control instead of / in addition to the keyboard. Very cool. Read the updates page for more. And check out all the photos I've taken. I have a 40x4 character LCD screen connected to the parallel port on my Pentium 233mmx system VIA Eden 600MHz system, and I wrote a perl script to let me choose mp3s to play, displaying my options on the LCD. I use a Gyration wireless (radio) keyboard for the input; it's very small, thin, and black. The box runs Slackware Linux, and is configured to boot directly to a sparse startup script that just loads USB and sound modules, and then runs the music script. It doesn't run any of the normal init scripts, doesn't go into multiuser mode, and doesn't create any extra terminals. Current boottime, from ignition to music playing, is 27 seconds. Probably the most important feature of my particular design is that it is interactive at the typed-character level: when you want to access a given band, you type just the first letter or two of that band's name, and the system responds immediately, "homing in" on the band as you type more. This makes it possible to select and play music from any band among a library of hundreds, usually in just 3 or 4 key presses. I think this is infinitely better than scrolling through hundreds of bands (though my script provides scrollability, as well.) The second most important (and cool) feature is the random-play modes: when I hit the tick key, it plays a random album from the hard drive, and when I hit the | key, it plays 100 random songs from all over the hard drive. The total cost of this project was about $300 $450. The computer is an old Pentium-I 233mmx that I already had a VIA EPIA ME6000, with built-in everything including 600MHz cpu, for about $120. I paid about $120 for a 40 gigabyte IBM notebook hard drive, $100 for the Gyration keyboard (as part of a keyboard/mouse/mousecharger package, so the keyboard itself isn't actually that expensive), $30 for the LCD screen, and various smaller amounts for things like cables, potentiometers, resistors, etc. This project is built on completely free software: the Slackware Linux operating system, the mpg321 music player, and a perl script that I wrote which runs everything. So you can build your very own musicbox. Just follow the instructions here to set up the computer, and then come back to this page to learn how to do the power and wiring. And don't hesitate to contact me if you need any help! Arrow keys scroll the folder/songlist and PageUp/Down will jump 4 folders/songs. Plays a random album from the hard drive when the tick key is pressed; plays a different one when you press it again. This is one of my favorite features. And pressing the | key will play 100 randomly-chosen songs from all over the hard drive. Displays Artist/Title/Album of currently playing song. Allows you to play/enqueue an entire folder, or play/enqueue one song at a time. 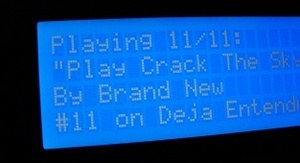 Enqueueing can be done while music is playing; or, pressing Enter on an album in the music library during playback will stop the current song, clear the playlist, and play your new selection(s). Playlist is saved to disk so you can reboot, etc and still have it. The position in the currently playing song is also saved (along with the current volume) across reboots, so it resumes right where you were like a normal car stereo. Optionally shows cpu idle percentage and free memory in a corner of the LCD. Remembers your position as you scroll through your list of bands (an essential feature for large music collections). It's pauseable! This was tricky to figure out since I'm running the mp3 player in a forked detached process. But pause is essential, and it's working. Seeks within tracks, and skips forwards and backwards in your playlist. Playlist editor lets you enqueue folders/songs, move songs up or down in the playlist, remove songs from the playlist, or jump directly to a specific song. Built-in volume control including mute. System startup time, from power-on to music coming out the speakers, is ~30 seconds. Only about 10 of that is linux; the power-on and POST process takes 20 seconds. Emulates a "normal" car stereo as much as possible: plays music automatically when you start the car, shuts off automatically when you turn the car off, and resumes playing at the same spot in the same song as when you last turned the car off. Has a built-in shell prompt, with output on the LCD screen, and a command history. TODO: figure out how to redirect STDERR to the LCD in addition to STDOUT; for some reason, the normal bash-redirection 2>&1 isn't working. Handy online help -- just press F1 to see what all the features and keys are. And the key bindings are all user-definable by simply setting them in beginning of the script. Displays your MP3 count, album count, and space used. This LCD has 16 holes on one end, arranged in an 2x8 matrix, for connecting all these signals. I bought a 2x13 header connector from mpja.com for 9 cents, and just snapped the extra pins off. Then I soldered that guy onto the LCD. This seemed impossible at first because the pins are pretty close together -- or at least, if you're not very experienced with PCB soldering, they seem close together. But it turned out to be pretty easy. And since a computer's internal gameport connector uses a 2x8 header, I found a spare one and cut the header off. I connected that to my parallel port cable, so it's easy to connect and disconnect my LCD. Finally, the other end of the LCD has 2 pads marked A and C (or A and K) for the backlight's anode (+) and cathode (-). I soldered a molex connector onto here so that this too would be easy to connect and disconnect. You can see photos of all this right here. The standard parallel port pinouts are as follows. Note that the signals and numbers are standardized (i.e., yours should be the same), but the colors are not. I get my +5V from the motherboard power connector; you can also find it in the gameport or USB connector. Note that VLC (the contrast voltage) needs to be negative. I get this from the motherboard power connector's -5V (which is more like -7V on my system...). I have 920 ohms of resistance between the -5V and the VLC pin on the LCD, and that gives me good contrast. For both the +5V and -5V, I spliced into the parallel port connector's cable (on pins 11 and 13) to send those voltages to the LCD. Make sure you actually sever the wires connected to pins 11 and 13 on the motherboard-side of the connector; you don't want to send those voltages into the motherboard. Note: I've since set up a second system to use for testing, which required making a second parallel-port-to-LCD cable. You can view the pin information for that cable here. I had to buy a special adapter (Kenwood CA-C1AX) to give my head unit an aux input, and I discovered that this $20 adapter can be easily home-made. Just follow these instructions. Anyway, I have a pair of RCA cables carrying the signal from my sound card (in the car's hatch) up to the head unit, into this adapter, and that's how I get my musicbox to play through my car stereo. RC circuit (diode, capacitor, resistor, transistor, top relay): necessary if you want the computer to automatically save the playlist and current song position when you turn the car off. Without these parts, the computer loses power as soon as the car shuts off (when ACC goes low), so you must manually tell the computer to save its state and shut off (by pressing a key; "!" by default) before turning the car off. Bottom relay: necessary if you want the computer to turn on automatically when the car turns on. Note: not to scale. The UPS battery is about 1/5 the size of the car battery, and the relays are smaller than one cubic inch. The second battery is a small sealed-lead-acid (SLA) battery taken out of a $40 APC UPS. It's there because a car's "12V" voltage sometimes sags a lot; for example it sags down to 9 or 10 volts during ignition. Computers are finicky about their 12V, and they reboot when it drops like that. By adding a second battery in parallel with the car's battery (and putting a big diode in between so the car doesn't steal the second battery's voltage too), I'm able to guarantee that there's always 12V available for the computer. So when I stop for gas and keep the music playing, the computer doesn't reboot when I start up the car again. The RC circuit is just a timer: when the input signal (the car's ACC line) goes away, the capacitor slowly discharges through the resistor, keeping the transistor forward-biased and thus keeping the relay open, thus keeping the computer powered. It takes the capacitor 3*R*C seconds to discharge, so that's how long the power stays on. Using a 7.5 kilohm resistor and a 470 microfarad capacitor, that works out to 3 * (7.5 x 10^3) * (470 x 10^-6) = 10,575 x 10^-3 = about 10.6 seconds. I have the head unit and my amps switched by the same circuit, which means I can have the musicbox fade out the music before everything shuts off. I have a small push-on-off SPST switch mounted near the head unit, so that I can forcibly kill the power if need be. CONNECTION:		P.C. Mount. UL/CSA Listed. LCD Pinouts. My first 3 LCD screens that I bought didn't come with any pinout listings, and I made the mistake of believing all the websites that say "all HD44780 chips are pin-compatible", and as a result, my screens didn't work. Control signals. These are the C0, C1, C2, C3 signals coming out of the parallel port that you need to use for your Enable and RS signals on your LCD. Which ones you'll use depends on the program you're using to write to the parallel port. If you use the same program that I did, then the pin connections that I listed will work. Contrast voltage VLC. I read on many websites that this should be grounded or should go through a "variable resistor" (potentiometer) to +5V. If you do that, you get no output on your LCD whatsoever, which is exactly what I got until I came across one obscure site that mentioned that this voltage needs to be negative. Soldering. My LCD didn't come with any handy wires or headers attached, so I had to solder it all up. And the through-holes are very very close together, so you have to be really careful not to use too much solder and not to run any of them together. Boot delays. On my system, if you don't have a "normal" (AT, or PS/2 with an adapter to AT) keyboard plugged in, the POST process takes an extra 5 seconds. Since I'm using a USB keyboard, I don't have any need for another one. But 5 seconds at boot is a long time when the total boot time is on the order of 30 seconds. So I took apart an old AT keyboard I had laying around, removed the circuit board, wrapped it in electrical tape to cover all the solder points, then stuck it inside the computer with the plug going out the back and into the keyboard port. So my system boots in 27 seconds instead of 32. UPDATE: now that I'm not using an AT motherboard, this problem no longer exists, and I don't have anything plugged into the new keyboard (PS/2) port.